The Malaga 5 is a high capacity water storage heater available in two versions; the standard Malaga, with an efficient gas burner, and the Malaga E, which has the additional benefit of an electric heating element. 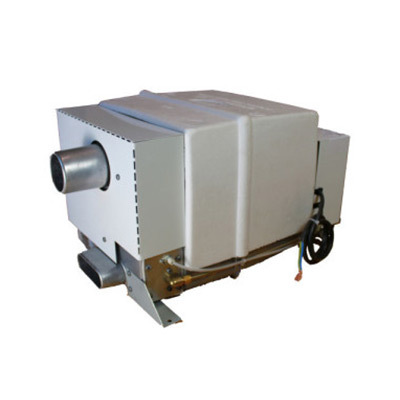 The heater will operate satisfactorily on either a system where the pump is controlled by the tap microswitches or the one controlled by a pressure switch. It must not be connect to mains water supply. Water connections can be provided to suit a range of standard fittings. Reinforced or semi rigid pipe must be used. Q: I have an old Carver P4 air heater do you do a replacement? A: Yes, the HS2000, HS2211or the HS2800. Q: Can the heater be mounted vertically? Q: Where can the heater be fitted? A: Most installations are mounted in a bedbox or locker. External installation is not recommended unless using the appropriate mounting box. However the HS2211 is designed to be fitted externally. Q: How noisy is the heater? A: There is very little burner noise from the heater itself. However, there will be some noise from the blown hot air similar to that of a small domestic fan heater. Q: Can the heaters be used while vehicles are moving? A: Yes, a vehicle in motion flue terminal is available and the heater should be installed and operated in compliance with the relevant regulatory requirements. Use of the the correct VIM bracket ensure compliance with the vehicle in motion test regime. Q: What length of exhaust flue pipe can be fitted? A: Total combined length must not exceed 4 meters and the inlet pipe should be slightly longer than the exhaust to balance the burner. Q: What is the electrical consumption? A: Yes, the HS2000, HS2211 or the HS2800. Q: How many outlets can you put on the Heatsource HS2000, HS2000E and HS2211? A: The maximum recommended is 3, providing the total combined length of ducting is no longer than 5 metres and the maximum length to the first outlet should not exceed 1.5m. Q: I want to replace my old Carver Cascade , will I need to cut new holes for the Malaga? A: No, we can supply an adapter plate with a new Malaga that will make a neat job of the inlet and exhaust termination. Q: I have an old Belling Malaga water heater that no longer works, what do I do? A: Two options here, we can either supply you a complete replacement Malaga heater or, if its only your control PCB that’s failed, we can upgrade your existing Belling unit. Q: What type of pump is needed to work in conjunction with the heater? A: The Malaga will work with an in line or submersible pump providing the maximum pressure does not exceed 1.5bar or 20 PSI. Q: Will it work on an electrical mains hook up? Q: How large is the Malaga water tank? Q: Are they suitable for marine use? A: No, except on vessels used exclusively on Class 1 & 2 Waterways, so inland waterways. The installation must be made where an external vertical or near vertical wall is available. Q: Where can I mount the heater? A: Typically in a bedbox or locker with easy access to flue through a side wall.